Welcome to Retro Flashback. This is where we dissect a horror film to see if it is an essential part of horror geekdom or mere copycat trash. We rate these films on their landmark status. Psycho, Halloween, Scream, and The Blair Witch Project are unquestionable landmarks. These film are a part of horror's lexicon and each began a separate movement in cinema. So where do movies like Re-Animator, Dead-Alive, or Street Trash end up on this scale? You'll have to come back to find out. "You think you go to heaven... You come to us!" Phan-tasm n. - Something that exists only in a person's mind. 1. a product of fantasy 2. a mental representation of a real object. A tall old guy, killer silver balls, monstrous midgets, a finger creature, a mutant fly, a badass musician/ice cream man, a guitar-playing duty shirking brother, a blind fortune teller with a buzzing box, and a deadly tuning fork all culminate to wreck the life of a meddling teenager. 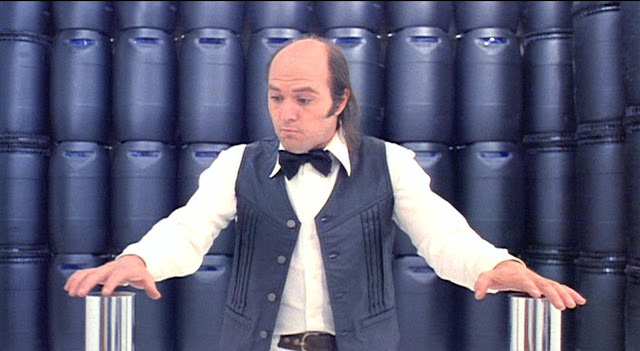 The world of Don Coscarelli's Phantasm is indeed a fantastic one. Its bizarre nature keeps building followers as the years pass, and the mythology of the tall man continues to unfold. In 1979, we witnessed the beginning of the apocalypse. It was not a bomb, a disease, or a war. The end began with a necromantical tall alien in the guise of a funeral director. His ritualistic modus operandi includes bringing the dead back to life as ghoulish dwarf zombies to do his bidding, and enslaving the world seems to be his goal. The cult status of Coscarelli's film is firmly cemented in the annuls of horror cinema. He has achieved cult fandom with nearly every film in his oeuvre. The Beastmaster, Bubba Ho-Tep, and most recently his adaptation of David Wong's John Dies At The End have all found their underground success. With Phantasm, Coscarelli set out to create a surreal and absurd nightmare. He used Dario Argento's Suspiria as a blueprint for dreamlike imagery and non-linear narrative structure. He also implemented elements of Alexandro Jodorowsky and Luis Bunuell's surrealist works. With these influences Coscarelli created a nightmare fueled by Jungian archetypal images. When Don Coscarelli was younger, he had a dream in which he was running for his life through a labyrinthine corridor while a flying steel ball chased him. 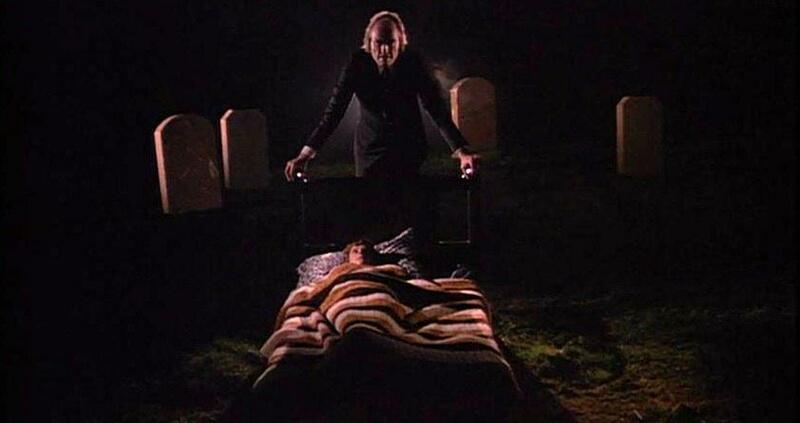 Since Phantasm is all about dreams, it is only fitting that Coscarelli's own nightmare inspired the film. At the age of 19, he became the youngest filmmaker to create a feature that was distributed by a studio. Jim The World's Greatest was sold to Universal Pictures. His first and second films did not fare too well, but he did get the opportunity to work with A. Michael Baldwin, Reggie Bannister, and Lawrence Rory Guy (A.K.A. 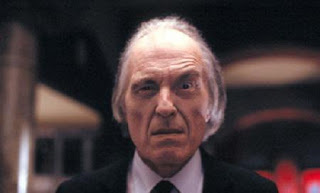 Angus Scrimm). After the letdown of his second film, Coscarelli decided to shift his focus toward horror. The acting troupe followed him down the rabbit hole, and what emerged was a film that seemed to understand the profound effect of a night terror. Coscarelli not only wrote and directed Phantasm, he also took charge of cinematography and editing. During a test screening, the film's length became its most detrimental element. Coscarelli went back into the editing room and made the conscious decision to trim the film of some of its character development in lieu of obtaining a dreamlike atmosphere. By taking lessons from Giallo films he established a method of absurdist plotting that would emphasize effect and mood rather than logic. 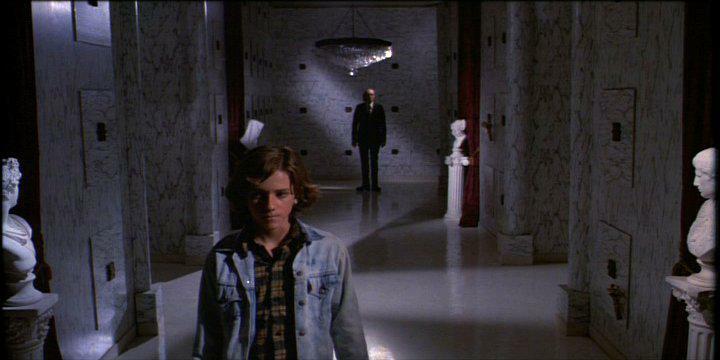 Phantasm is told from the point of view of the thirteen year old Mike (A. Michael Baldwin), whose parents have recently died. Mike's only caregiver is his older brother Jody (Bill Thornbury). Mike's fear of abandonment runs deep; this is shown by him obsessively following his brother around. He believes it is only a matter of time before he is completely alone. He continuously whines about it, so we get the point. Abandonment and death replace the normal angst of a teen. He keeps a close eye on the cemetery, because why not? When he sees the tall man pervert the rituals of death, he dives head first into the mystery at Morningside Mortuary. Only by uncovering the tall man's intent will Mike's heroic dream fantasy allow him to overcome his real-life fears. Lets break this down in true spoiler fashion: Jody's already dead at the beginning of the film. Yeah, he's dead. The movie all takes place inside Mike's unconscious. The tall man, the silver balls, the killer dwarfs, the tuning fork... all of it is the delusion of a really messed up kid. His subconscious develops this story as a way of playing out his real grief over the loss of his entire family. The theme of overcoming fear comes up again and again through Phantasm's narrative. Like any tale of a hero against the world, he must overcome himself before he can triumph over the beast. The epitome of this theme comes in the form of a blind fortune teller. She tells Mike to place his hand in a black box, and only when his fear subsides will he be able to retrieve his hand. If it sounds familiar, that's because it is. The influence for this sequence comes from Frank Herbert's 1965 epic Dune. A similar scene can also be found in Flash Gordon or the caves of Dagobah, where the hero has to undergo a similar test. The tall man is the embodiment of death. In other words, Angus Scrimm is scary-looking. He's a tall alien with a funny walk and a guttural voice. Hey, it's Mike's dream, death can take whatever form it wants. 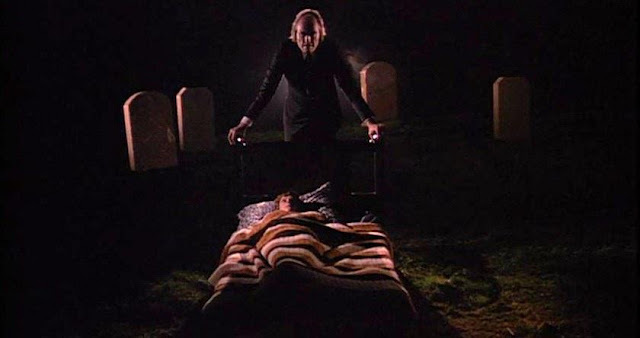 Since the whole plot of Phantasm is merely Mike's psyche working through the grief of Jody's passing, then defeating the tall man is Mike's unconscious dealing with death. Mike's dream has created this heroic journey. By slaying the monster he may return to his sad reality more courageous – though still an orphan. Let's look at how the dream sequence is normally handled in horror films. First, we are shown the character falling asleep, though this rule can be broken if the filmmaker wishes to slowly abandon reality. Second, the dream is placed within the narrative to provide for a new scare for the audience, but it can also provide a cryptic prophecy. Third, once the dream is over, the filmmaker re-establishes reality (usually through a series of false awakenings). Since the whole film is a dream, Coscarelli has no qualms about destroying our preconceived notions of the horror dream. He provides an almost inverted moment when Mike wakes up inside a dream. The tall man stands over his bed, and then with a jump-scare the zombie dwarfs are attacking him. Coscarelli doesn't show Mike waking up in a cold sweat. Instead he cuts to a sunny afternoon. The tall man passes Reggie's ice cream van, and we're left wondering if the dream is over, or really, just in general, what the hell is going on? Now, since the film is the dream, did Mike wake up into an Inception-like next level? This is all a part of the Coscarelli editing lesson: cut for dreamy atmosphere not logic. The hero archetype is one we've seen throughout history. Luke Skywalker is a perfect embodiment of the hero type, and since Lucas modeled Star Wars after Greek mythology it is only fitting. The hero is born into an unusual circumstance, is constantly in danger, his fear tested, has spiritual guidance, issues with his patriarch, and a special weapon. Mike may not have all of those elements, but who's counting? He does, however, make a weapon out of a shotgun shell and a hammer. 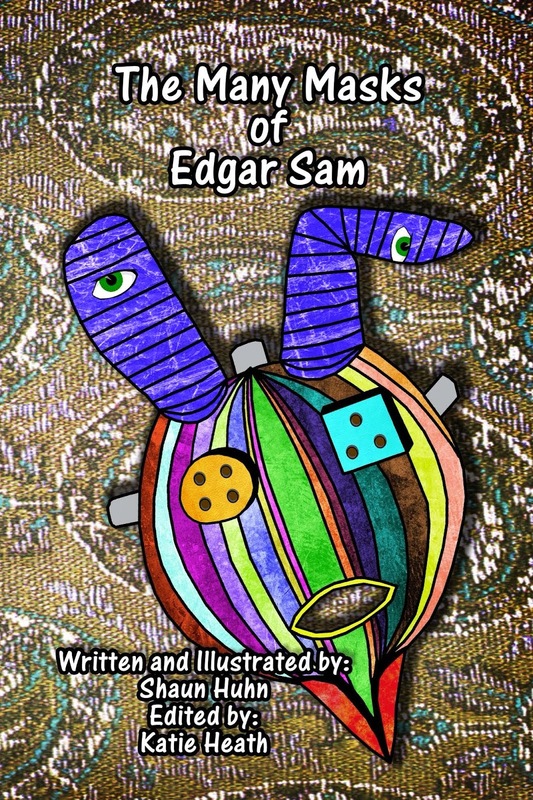 The hero normally undergoes a traumatic experience that leads him to his quest. I'd say that the death of his parents warrants the category of trauma. This leads to another characteristic of a hero – he is removed from his family. Same thing – dead parents. Even though he must defeat death, Mike has some good times too. He gets to drive an awesome Plymouth Barracuda, hang out and drink with musicians, and shoot plenty of guns. As far as nightmares go, it could be worse – oh wait, he's an orphan. When viewed as a psychological fantasy, the bizarre and incoherent narrative begins to work. There are a few factors at work with Phantasm. 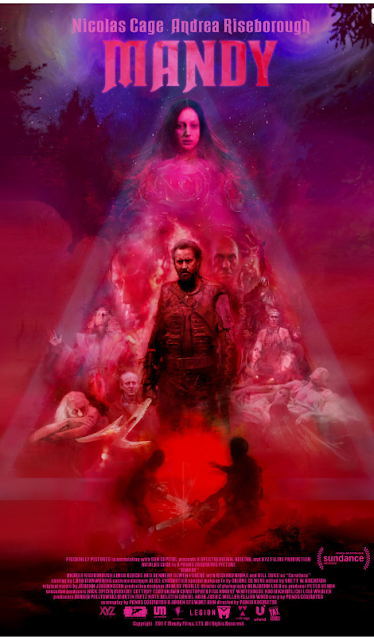 While it did not spark an entire movement in horror cinema, it found it's cult audience rather quickly. There are four sequels, which does make a case for its true landmark status. All of the films were independently produced by the same writer and director which also give it a higher ranking. In the end Phantasm is no Halloween, yet cannot be written off as merely a film to be seen when there's nothing else available. 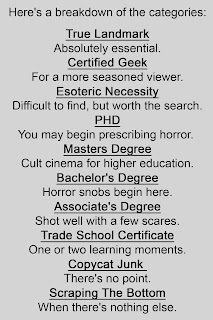 So where exactly does it fall in horror education? 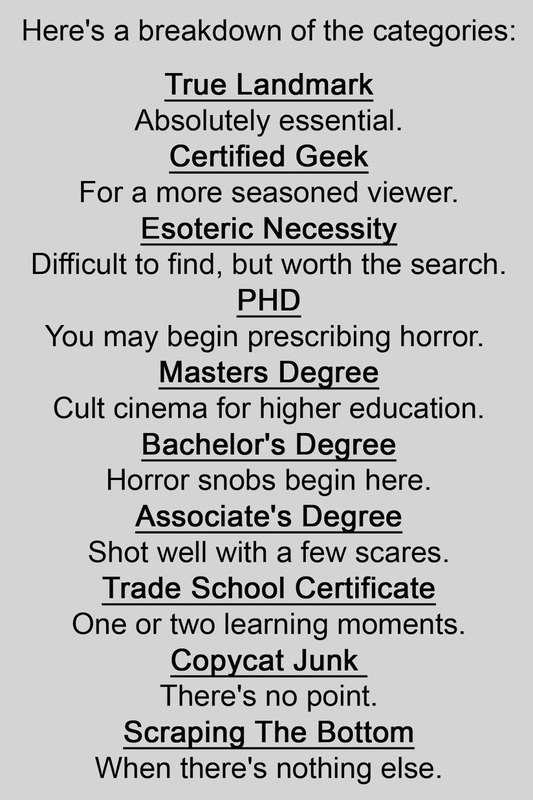 Within the landmark categories, Phantasm will earn you a PHD. It stands for something very special within the horror community. The idea of independence from a studio in all of your film making decisions over the course of five films, while creating lasting images on a minuscule budget make Phantasm a true horror maverick.